Between 48th and 49th Avenues North in the Cherry Grove section of North Myrtle Beach, South Carolina there is a North Myrtle Beach resort that is right across the street from the Atlantic Ocean. Your family will be just steps away from the white sandy beaches when you choose Marsh Villas for your next North Myrtle Beach vacation destination. This North Myrtle Beach resort is only three stories high so you can be out of the car and into your comfortable North Myrtle Beach vacation rental in just minutes. When you vacation in the Cherry Grove section of North Myrtle Beach, SC you will be near the Atlantic Ocean and its white sandy beaches and the salt marsh inlet and its calm waters that are ideal for kayaking. Choose a two-bedroom condo in North Myrtle Beach, South Carolina at Marsh Haven and enjoy accommodations for up to six people. These two-bedroom North Myrtle Beach rentals have one full bath and one half bath for your convenience. But that is not all. There is a nicely furnished kitchen in these North Myrtle Beach condominium rentals. With full-size appliances and all the cookware and dishes you need, these kitchens are well designed for making your family a hot breakfast before you go out to the beachfront or visit all the nearby North Myrtle Beach attractions. There is even a dishwasher in the nicely furnished kitchens at Marsh Haven. Serve snacks at the breakfast bar, which is adjacent to the dining table. This kitchen and dining areas in these Marsh Haven North Myrtle Beach rentals overlook the living room so everyone in your family can remain in on the conversation regardless of where they are hanging out. There is a balcony in these North Myrtle Beach vacation rentals that are either situated so you can catch an early morning sunrise from your balcony or an end-of-the-day sunset. Enjoy the fresh air and sea breezes that are felt while you relax on your private balcony at these North Myrtle Beach condominiums. 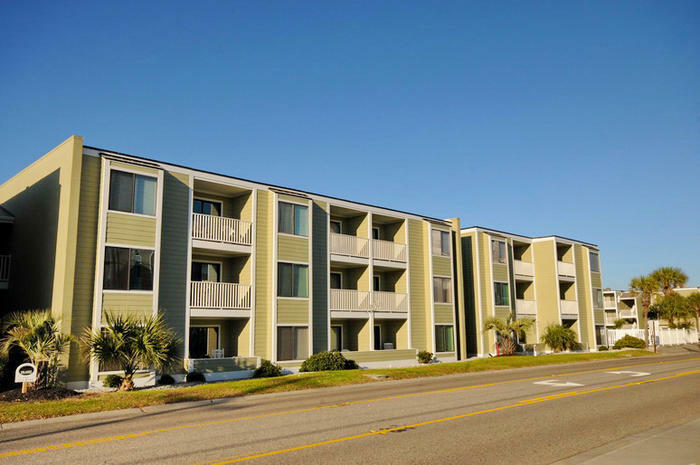 High-speed Internet access is available for many guests who stay in these Marsh Haven North Myrtle Beach condominium rentals. Bring your laptop computer and get online to email pictures back home to your friends, peruse the menus of nearby restaurants and check out show times for the live entertainment theatres that are in close proximity to Marsh Haven. These North Myrtle Beach condos also feature a DVD player so you might want to bring along your favorite movie. When the weather turns cooler or if a rain shower sprinkles on your North Myrtle Beach vacation day, a movie in the comfort and privacy of your North Myrtle Beach condominium at Marsh Haven just might be the perfect ticket. Elliott Beach Rentals is not affiliated with onsite management or the HOA of Marsh Villas.